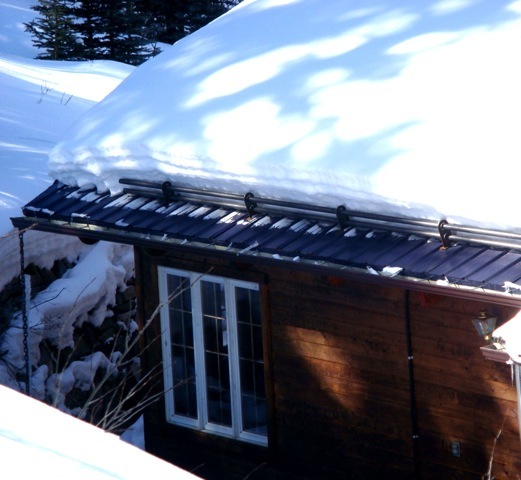 HEATED ROOF SYSTEMS offers you our exclusive patented technology that provides a concealed snow melt mat, placed under various roofing material to eliminate Ice Dams. Our “mats” can be placed under asphalt shingles, synthetic slate and shake, and both standing seam and pro-panel roofing, giving you the continuous look to the roof edge. Our heaters have a 3M self adhesive backing, and in one picture, the installer is using a heat gun on a cold day to help adhere the heater. Our competition offers the same repetitive version of a single strand or two of heat tape under a horizontal metal band. Most extreme Ice Dam problems require a wider band of heat. We offer a 14” melt band within a single row. More importantly, "metal shrouded heat tape" is a poor choice for valley applications. As our mats are placed under the roofing material vs an external mounted “metal channel”. Most of our clients prefer the continuous look of their roofing material to the roof edge, and not a horiizontal metal band , or the unsightly look of "zig zag" heat tape. We also offer the best solution for “Flat Roofs” Placing our “ mats”, under EPDM/TPO type rubber membrane systems. We can create heated pathways to your roof top equipment. And offer direct melt to the roof drains. To be sure our roof ice melt system is installed properly, we recommend the consumer to choose one of our certified installers for their application. 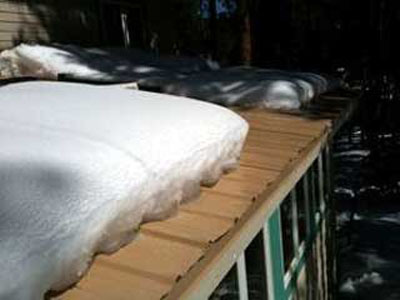 Heated Roof Systems offers our "roof rescue mats" in various sizes, and wattage configurations. Check out our growing network of certified HRS Installers nationwide. Our Heated Roof System offers a wire wound built resistant heater sandwiched in Silicone vs the use of "conventional" strand heat tape placed under a metal edge. Simply put, our technical advantages are light years ahead.